Mahathir Mohamad, 92, who was the prime minister of Malaysia between 1981 and 2003, is quite popular in the country and his tenure is said to have been marked by rapid development and modernization. 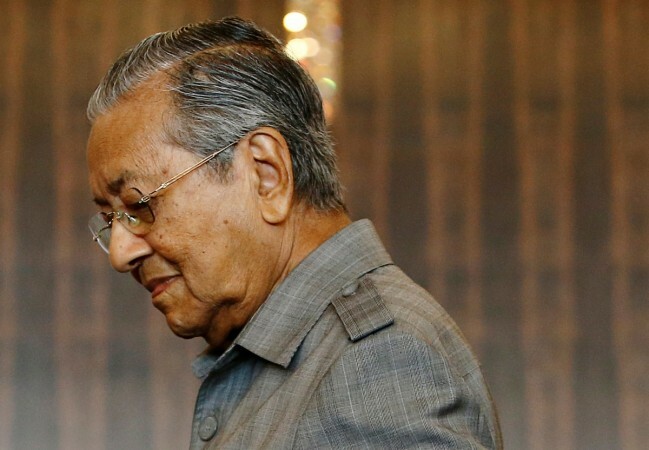 Malaysian leader Mahathir Mohamad is set to become the oldest prime minister in the world after defeating Najib Razak in the recently held elections. With this, Mohamad has brought an end to ruling coalition's 60-year rule. The 92-year-old, who was the prime minister of Malaysia between 1981 and 2003, is quite popular with the residents of the country and his tenure is said to have been marked by rapid development and modernization. His supporters are thrilled with the results of the election and have said that they have been waiting for Mohamad to be sworn-in by the king. The swearing-in ceremony is likely to take place Thursday, May 10. "We are so happy, such a proud day for Malaysia," the Guardian quoted resident David Thaiga as saying. "We have been waiting for this for the past 60 years. This is a miracle for us. And even though I was not a fan of Mahathir, I think he was the only one who could have brought this victory." Another resident of Malaysia Sukumira Sekhar, who is 84, explained that people are really happy and the elderly are glad they have survived to see the moment. "I'm so happy I survived to see this. I wish I could jump up and down for joy, but be sure my heart is jumping up and down. I'm so proud of the people of Malaysia, especially the young people and the Malays who swung it," Sekhar added. Meanwhile, Razak, whose nine-year rule has now ended, said that he had accepted people's choice. "I and my friends accept the verdict of the people and Barisan Nasional is committed to respecting the principles of parliamentary democracy," Reuters quoted Razak as saying. Mahathir is one of the first members of the United Malay National Organisation, which was formed with an aim to seek independence from Britain. He was, however, expelled from the party for criticizing Malaysia's first prime minister, Abdul Rahman. He is known to have ruled Malaysia for 22 years, which made him the longest serving PM. Mahathir's tenure saw Malaysia developing rapidly and his government undertook several infrastructure projects. The 92-year-old is married to Siti Hasmah Mohamad Ali and the couple has three children – daughter Marina Mahathir and sons Mokhzani Mahathir and Mukhriz Mahathir. During his term, Malaysia is known to have maintained its relations with other nations, but it did have a disagreement with the UK over the tuition fees of the national university. Post this incident, Mohamad is known to have urged the country to boycott goods from the UK and also led the "Buy British Last" campaign. Even though Mohamad was born in British Malaya, he is known to have Indian roots. His father Mohamad bin Iskander was reportedly Indian with a Malay mother with ancestors from the south Indian state of Kerala. Razak has often taken digs at Mohamad's ancestry, and this has not really been taken kindly by the PM. It was earlier even suggested that he was "embarrassed" about it and he had reportedly used a derogatory term while speaking about Indians. However, he is later known to have apologized for the same. "I would like to apologise to the Indian community because I used the derogatory term. "I never meant to insult anyone but when I was a boy, we used that word but it is now considered derogatory. I apologise if I have caused any problems to them," Mohamad said during a press conference.